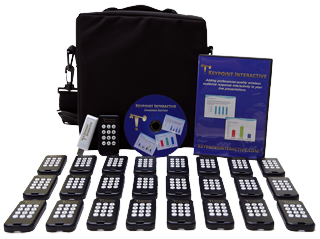 The development team at Innovision Incorporated has applied our many years of audience response experience to create Keypoint Interactive. Keypoint is an interactive add-in for Microsoft PowerPoint. It has been specifically designed to seamlessly integrate with the new suite of Office products. Keypoint incredibly easy to use! Tired of wasting time on paper ballots? Get instant results with Live-Tally! Are you currently conducting "parliamentary" style voting and elections in live events? We designed our Live-Tally solution specifically to make voting on motions, amendments and elections as quick and easy as possible. Live-Tally makes following common parliamentary proceedures simple while still being flexible enough to adjust to the specific rules of your organization. Allows you to pre-build motions and election content in advance. Create new Elections or add candidates nominated from the floor on-the-fly. Build new motions or handle amendments and substitutions to existing motions on-the-fly. Every action is logged so you'll always know what happened. Export reports PDF and CSV files. Give different voting "weights" to each participant.